but rather in her ability to repair her faults." Last week, Detroit filed for bankruptcy, making it the eighth American city or town to do so since 2010, and the largest municipal filing in American history. The city is sinking under as much as $20 billion in debt. By 2017, it is expected that 65% of Detroit's revenue will funnel into legacy expenses, leaving little funds left over to run city operations. Those who know the Detroit of the auto industry golden days are expressing disbelief at its spectacular demise. From the turn of the century, when Henry Ford and Louis Chevrolet turned Detroit into a major economic cornerstone of the American economy, to the early 1980s, Detroit was a bustling, successful metropolis. Between 1900 and 1930, Detroit's population spiked from about 285,000 to 1.5 million. With it came revenue, both individual and municipal, and all the leisure and recreation perks that come with a city making money. As of 2010, only about 700,000 people remain in Detroit. On the left is a photo taken circa 1907 of Belle Isle Park, where people enjoyed botanical gardens and boat rides along the Grand Canal, while bands played on the bridge. On the right, an 830 square foot home in Detroit presently on the market for $70. Seventy dollars. Plus, most likely, back-taxes owed on the property, not to mention the money required to repair or nearly rebuild the home due to damages done by lack of upkeep and the persistent looting and robbery of abandoned homes in dilapidated Detroit neighborhoods. Detroit's rise and fall in one century is truly stunning. A city that once epitomized the American Dream now has the highest crime rate in the country. Detroit is pure extremes: The overwhelming share of the city is destitute, it is (barely) kept afloat by government subsidies, there are vestiges of money, but only in the hands of a very few, and there is absolutely no meaningful middle class. If you pull back, a great deal of America doesn't look all that different from modern day Detroit. Most of America seems to be kept alive by the steroids that are government-subsidies. 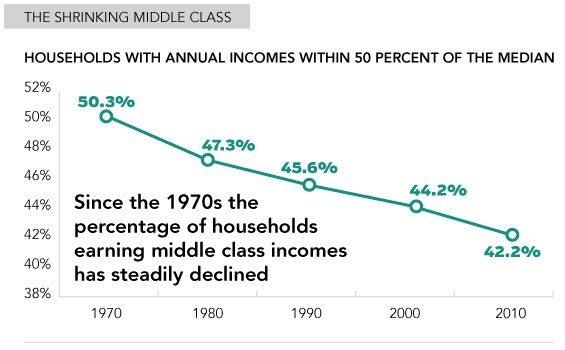 The middle class is shrinking all over the country, and the spread between the lower and upper classes is expanding. More and more money is pooling at the far right of the bell curve. What is happening? In Detroit, we know that the collapse of the American car industry is a primary culprit, exacerbated by decades of bad city management. But we can't help but think there's something else at play, something bigger, something tectonic and fundamental, maybe permanent, and something that's also impacting the rest of America, What's changing? If you look around, pretty much everything we've known as the United States for decades is changing. Blue-collar jobs are not what they used to be, not yet what they might be, and the middle class is shrinking. The corporate job ladder is disappearing; traditional ways of amassing wealth are now questionable at best, and certainly ever more inaccessible. The way we work, how we do our work, the kind of work we do, the content of it, are all evolving. Entire industries have been turned on their heads. Many more are teetering on the obsolete, and new industries are, we hope, waiting to bust out from the wings. Technology is disrupting just about everything, from how whole industries and companies operate, to how we learn, work and play, perhaps even to how we govern in the future. Simultaneously, the demographic make-up of our country is swinging widely away from Caucasian to soon-to-be-former-minorities, causing major socioeconomic and cultural shifts along the way. People are flowing into urban centers. Houses are getting smaller. What was once owned - a car, a bike, a home - is now being shared, causing us to trend "asset light." We are, one could say, living in a New America. This is not necessarily a bad or good thing (or perhaps it's both a good and bad thing), it is just a fact, an indication that fundamental shifts are afoot. What will this mean? Hard to say, of course, and one issue of TLV is certainly not enough space to unpack the manifold things changing in our country and their implications. So, for this particular issue, we will offer a snapshot of areas undergoing dramatic evolution, and in each ensuing TLV, we will include a new section grappling with The New America. For a bird's eye view, click the following "100 Years of Change" image to see the full infographic detailing how life in the U.S. is different from 100 years ago. Please see below in the "The New America" section for an overview of the ways our country has and is dramatically changing, and some insight into what it might all mean for the future. we have great capacity - intellect and resources - to do some thing about them." What can a middle-aged man do to revive the animal spirits of his youth? Certainly there are physical and mental exercises that can help keep one's mind and body as fit as possible, but no one lives forever. Mother Nature's life cycle applies to everything in the physical universe. There is no fountain of youth for anyone. Galaxies, stars, planets, and certainly human beings all experience the cycle of birth, life, and death, and then rebirth into some other form. Can this inescapable law also apply to economy? Given what history has shown, it would seem so. No empire in history has remained an empire in perpetuity. There has been no eternally youthful sovereign nation, no eternally youthful economy. The once powerful Greeks and Romans are now represented by some of the weakest economies in the developed world. The empires of England, Spain and France exist no longer. Hoping to find a return to their previous vitality, these former empires have now banded together. The aspiration to return to a more youthful economy by combining forces has proven much more daunting than expected. A team of middle-aged economies burdened by ever more rules and infrastructure is faring poorly in the global competitive market. The once mighty Japan, an economy that many people thought not long ago would dominate the world, has remained relevant the last twenty or so years only by stretching the limits of sovereign borrowing. That strategy has run its course with no return to organic vigor, so Japan has chosen to print money, the ultimate economic Viagra. But just as performance enhancing drugs and plastic surgery help the ageing experience only a brief semblance of youth, there is no permanent return. There is no transition from developed to emerging markets. There is only the emerging that eventually become developed. Youth turns to maturity eventually. It's the indisputable law of Mother Nature. Unlike a wise, contented human, economies do not generally age gracefully. Instead they thrash about, fighting the signs of age. So it becomes the job of governments to find, to create, and, as we are watching today, to conjure up anything that possibly keeps or returns an economy to its youthful, emerging vibrancy. The very sustainability of government makes such effort mandatory. Order must be maintained for civil society to remain. Only with time will we be able to see whether man can actually escape the laws of Mother Nature. History has not shown a kind example. Long-term interest rates recently rose as more and more people begin to question the value of the Fed's policy of monetary manipulation. Fixed-income savers are being pushed into riskier investments. Capital is being misallocated to less than highest and best efforts. Bubbles are either created or sustained. Seemingly better economic activity has also caused rates to rise. Job growth remains steady. Mass firings have fallen. Housing has seemingly stabilized. Auto sales have been very encouraging. And with the oil & gas boom, the cost of electricity has fallen. To many, the recent rise in long-term interest rates seems appropriate. Fixed-income savers need more return from less risk. Capital needs to be better allocated. And so long as economic activity keeps improving, then it's time for the Fed to reduce its pedal-to-the-metal monetary stimulus. But Ben Bernanke doesn't seem so convinced, and neither are we at L&A. Given the last few years of enormous Keynesian stimulus, it should seem obvious that economic activity would improve. Run enough electricity through a dead body and it will likely twitch and turn. Bernanke knows this, and he also likely knows that the employment growth we are seeing is of little material value to our economy. Adding more restaurant, retail and temp jobs, the leading sectors of employment growth, is not a sign of strong and sustainable economic activity. Our problem is obviously structural and not cyclical. But where is the structural break that needs fixing? Looking at those job growth sectors tells the story. Our economy has become too service-oriented. Service can't be serving service that serves other service. The buck of payment has to stop somewhere, and production is the ultimate economic waterfall catalyst. So no matter who thinks interest rates should be higher and for what reasons, the Fed and Washington should continue to embrace Keynesian stimulus until the economy creates significantly more production jobs. Only at that point will there be substantive waterfall economics that warrant growth in the service sector. The key to success can be described with three little words...always exceed expectations. Of course there are many who succeed by means other than well-directed and well-intentioned effort. We might sometimes see prosperous people who don't appear all that honorable or capable and wonder if perhaps their success can be attributed to getting lucky, being in the right place at the right time. This of course happens. But those who succeed by nothing more than right time, right place might be bound to suffer the wrath of wrong place, wrong time. That is just the way of the imperfect world we must live in. Rain doesn't always come when the crops need it, and sometimes too much comes too quickly. The most assured path to career and life success has to be those three little words, always exceed expectations. No matter of timing in one's life, in one's career, living by these three little words with vigor and conviction will surely provide worthwhile economic bounty. Even more importantly, your behavior will set example to those who follow you. Employer-provided medical care was available to 85% of full-time private industry workers in the United States in March 2013. By contrast, only 24% of part-time workers had medical care benefits available. Access, or availability, also varied by employment size: 57% for all workers in small establishments (those with fewer than 100 employees) compared with 85% in medium and large establishments (those with 100 employees or more). Median weekly earnings of the nation's 104.2 million full-time wage and salary workers were $776 in the second quarter of 2013. This was 0.6% higher than a year earlier, compared with a gain of 1.4% in the Consumer Price Index for All Urban Consumers over the same period. In June, the West continued to have the highest regional unemployment rate, 7.8%, while the South had the lowest rate, 7.2%. Over the month, no region had a statistically significant unemployment rate change. Significant over-the-year rate changes occurred in three regions: the West (-1.6 percentage points), Northeast (-0.7 point), and South (-0.6 point). 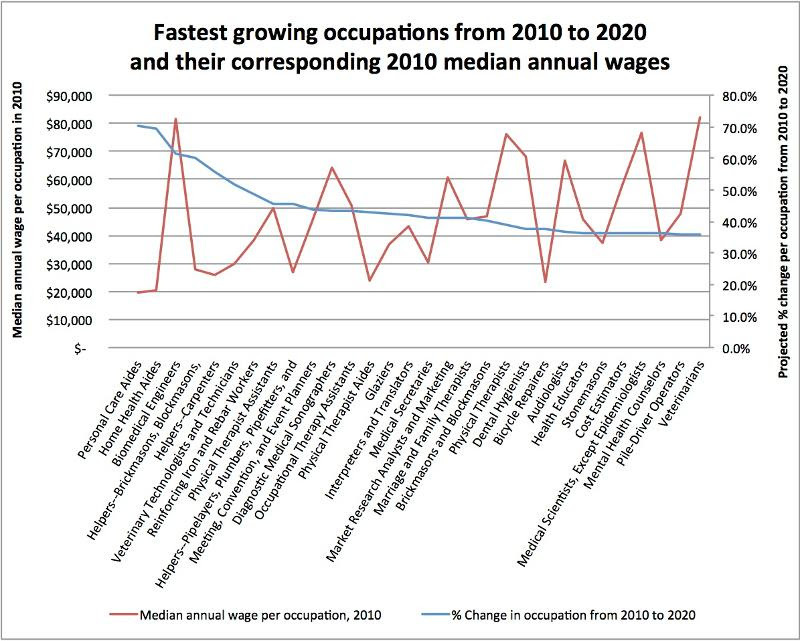 The following chart shows the Bureau of Labor Statistics' projections for the thirty occupations expected to grow the most from 2010 to 2020, as compared to each occupation's 2010 average annual salary. The BLS expects that the average growth rate for all thirty occupations will be 14.3%, and the median annual salary for these occupations is $33,840. The expected fastest growing occupation, with a rate of 70.5%, is Personal Care Aides. Their average annual salary also happens to be the lowest among these thirty occupations, coming in at $19,640 per year. Six of the ten fastest growing occupations fall below the average $33,840 annual salary. The majority of the higher earning jobs show the slowest projected growth. "One cannot be an American by going about saying that one is an American. Lower-wage occupations were 21% of recession losses, but 58% of recovery growth. Mid-wage occupations were 60% of recession losses, but only 22% of recovery growth. Higher-wage occupations were 19% of recession job losses, and 20% of recovery growth." In short, the lion's share of the jobs added since the crash are not jobs that will put people on an economically mobile path. Meanwhile, higher-wage jobs have rebounded entirely, widening the gap between those earning low-wages and those earning high-wages, while gutting the middle. Mid-wage jobs, like construction, insurance, information technology and manufacturing, were hardest hit in 2008, and have shown the least recovery. Many of these once middle-class workers now find themselves in lower-wage jobs, contributing to a 30% loss of middle-class wealth. Meanwhile, the costs of basic amenities needed to live, like rent, food and gas, have gone up, leaving the middle class totally squeezed. 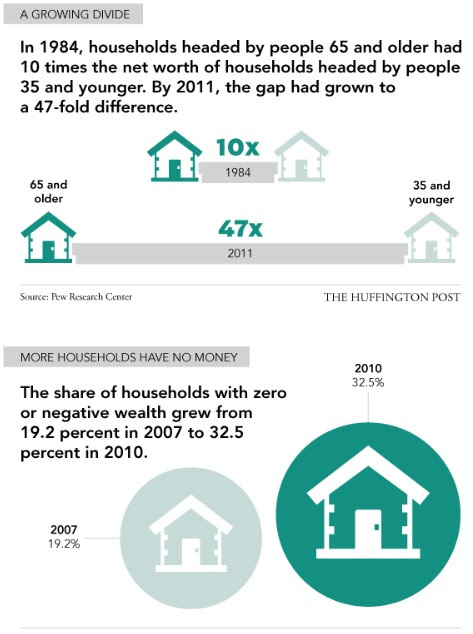 See below for a selection of graphic data about the shrinking middle class, or click here for the full infographic. By the end of this decade, no single ethnicity will statistically dominate our country, likely rendering the term "minority" a notion of the past. According to recent Census Bureau reporting, the diversity of children is increasing faster than previously expected, while the number of people 65 and older is predicted to be 1 in 5 by 2060 instead of the 1 in 7 it is now. 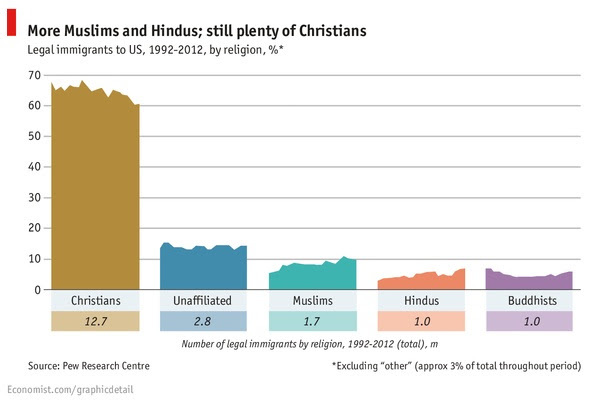 The religion of legal American immigrants, and the countries from which they come, has changed significantly in the past twenty years. In 1992, most immigrants came from Europe, Latin America and the Caribbean, and 68% of immigrants were Christian. Today, 61% of those relocating to the U.S. are Christian, and the percentage of Muslims and Hindus has doubled, moving from 5% to 10% and 3% to 7% respectively. Fifty-three percent of present-day immigrants are coming from Asia, sub-Saharan Africa and the Middle East and North Africa. Gallup first asked Americans if they approved of interracial marriages in 1958, and only 4% expressed acceptance of black-white unions. Today, that number has skyrocketed to 86%. 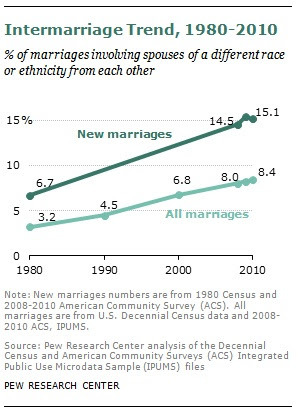 This is a good thing, given that 15.5% of new marriages are now between spouses of different race, and 8.4% of all marriages are interracial. In 2012 and for the first time, the rate of immigrants from Asia surpassed that of Hispanics, which indicates a drop in illegal immigration and a response to the demand for higher-skilled workers and the economic shift from manufacturing to technology. Asian-Americans overall are a well-educated and successful class of immigrants. Over 60% of Asian immigrants between the ages of 25 to 64 have college degrees, which is double the average college graduation rate of immigrants from other countries. The college-to-workplace formula is getting fiercely upended. College no longer guarantees employment, internships don't often turn into jobs, and students are graduating with crushing debt. Several factors are at play here, but a key one is the very education system that is burdening young Americans with overwhelming student loans that will, for years, stand in the way of their ability to spend and save. Not to mention that the job market remains particularly brutal for recent college graduates. Young college graduates are facing an 8.8% unemployment rate (compared to 5.7% in 2007), and an underemployment rate of 19.8% (compared to 9.9% in 2007). A recent study shows that 50% of students don't need a classroom to learn, and 39% believe that education will become more virtual. Imagine how respected, widespread virtual learning could democratize education, lowering the overall costs of education and giving access to a higher quality education to students who might otherwise not be able to afford to move for school. 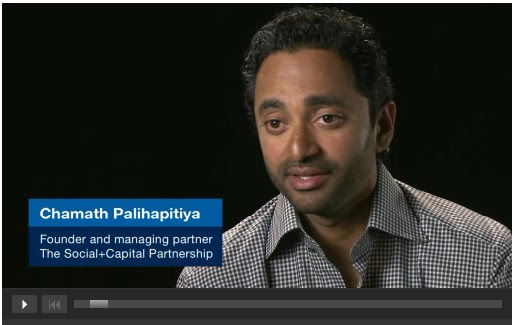 In a McKinsey interview, former Facebook executive turned investor, Chamath Palihapitiya, says that "technology will disrupt every facet of every job." The people who will thrive in the new economy will be those who speak the language of technology, and the companies that survive will be those that build "technological proficiency" into management. He notes that the issue with much of our technology-driven productivity gains today is that it "leaves more people behind in many ways more than it [pulls] people forward." Yet he makes the point that as things become less mechanical and more technological, we need more workers with technological skills. By and large, this is coding, which is referred to as a language, one that Palihapitiya says is getting more broadly defined and simplified, and thus accessible to more people. He argues that our education system needs to catch up with our economic shifts and teach coding like it would teach Spanish, so that students are naturally prepared for the economy before them, where, Palihapitiya believes, coding will fill the now gaping blue-collar job space. "Learn to code," Palihapitiya says. "Everything else is secondary, college doesn't matter that much. [Coding] is the most important job of the next one hundred years." Author Hugh Howey's book, Wool, sold half a million copies, became a bestseller, generated over $1 million in royalties, and movie rights for it were sold to Ridley Scott - all before the book even landed on shelves. Howey self-publishes through Kindle Direct Publishing, and when traditional publishing houses began approaching him, he smartly retained digital rights so that he could continue to own all digital royalties. Several new and lesser-known authors are eschewing the rules of traditional publishing and choosing to self-publish, and earning far more as a result. (In an article on Salon, Howey shares multiple self-publishing success stories.) Big-name, "traditional" authors are also beginning to see the economic value of self-publishing. Bestselling author Tucker Max decided to part ways with his publisher and self-publish, famously declaring how much more money he made when the publishing house was cut from the process (triple). Smashwords' founder, Mark Coker, explains how self-publishing has moved from option of last resort to a viable and profitable option for authors trying to break into the market. Read more for his first-hand look at what's happening to traditional publishing as self-publishing gains favor, even with big-name, established authors. As a consequence of the Great Recession, and the age of the McMansion that ushered it in, Americans are trending towards smaller homes, with an emphasis on practicality. New homes are less about demonstrating wealth, and more about efficient use. In the mid-2000s, American homes were on average larger than homes in all other countries, coming in at an average 2,500 square feet in 2007. That average has now been cut to 2,377 square feet, and is expected to continue to fall. Interestingly, because of the rise of the remote worker, more people are asking for a workstation or desk in their kitchens, so they can continue to work while preparing meals. The following chart shows average home size in a few different countries circa 2006. As we've discussed in TLV before, the share and trust economy has arrived. Through websites like Airbnb and RelayRides, individuals are renting out their homes, cars, and all sorts of other things to perfect strangers. The rentors are generating additional income by sharing their belongings, while the rentees are saving money on items they don't necessarily need to own. The share economy is efficient, sustainable and creating dots of micropreneurship all over the world. It's also allowing assets not once thought of as monetizable to become, well, monetizable. Have a few feet of your driveway to spare? Rent it to someone needing a parking spot via Parking Panda. At the crux of this trend is trust. The result is new revenue streams for individuals, economic opportunity for the company aggregators, and better-managed consumption choices for us all. which our heritage of religious freedom has inspired." 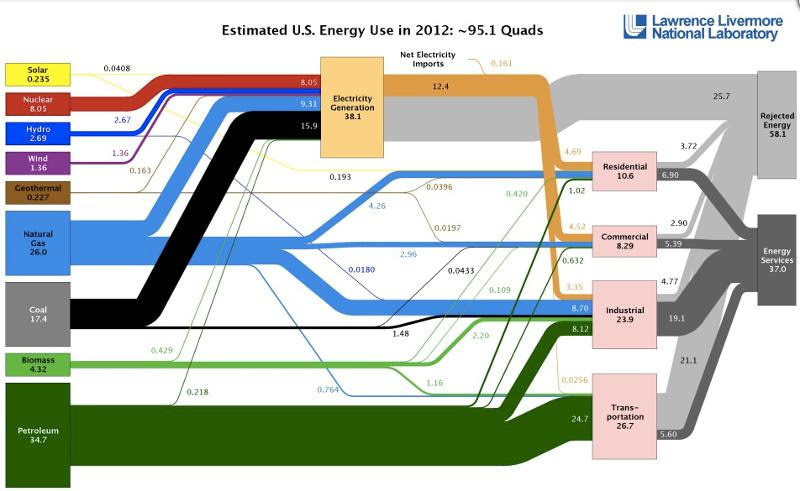 The chart below, representing energy usage in 2012, shows the flow between different sources of energy (left) and different consumers of energy (right), as well as the percentage breakdown of energy sources and energy users. "Rejected energy" is energy lost in transportation through grid inefficiencies, heat waste and exhaust, and it accounts for a stunning 58.1% of energy "use." Renewables remain a tiny portion of energy usage. Petroleum dominates transportation, but is only minimally used to generate electricity. Click here or the image for a larger view and more conclusions. Clear communication is critical to effective leadership, and what is communication if not words? This article offers six tactics to use impactful and careful language for more inspiring leadership. An example, use "but" with caution. It's contradictory, undermines praise and confuses employees. The article suggests, "A leader will address a team, 'This group did great work last quarter, but now we have to focus.' Better to say, 'Your great work last quarter is just the momentum we need, because this quarter will be a bigger challenge.'" No leader or company will ever entirely escape setbacks or failures, especially in our current economy. In her research on effective leadership, this author of the book Confidence cites resilience as the common thread in successful companies and their leadership. But leaders can't just be resilient, they must also take it a step farther by learning from their mistakes, taking accountability and showing remorse for them, as well as taking initiative to collaborate on improvements going forward. According to a study of employees of an Indian call center, new hires were 60% less likely to quit within the first few months if their individual skills and uniqueness were highlighted in their onboarding process. Employees who got this initial treatment also worked more efficiently and made fewer mistakes. Research shows that happy employees are more productive and less likely to look for another job. Happy employees tend to feel appreciated by their employers. Seventy-six percent of employees who have been recognized by their employers love their jobs, while only 37% of those who do not feel appreciated love their jobs. Click here or the image for more data about the power of appreciation and suggestions for employee recognition.